Sarah has a wonderful best friend, is on track for a promising journalism career and has long since learned to deal with the whispers and looks that are unavoidable when you’ve been blessed with a remarkably large nose. But when Rock arrives at her school and she and her best friend both fall for him, Sarah is forced to choose between following her heart, or remaining loyal to her friend. The decision seems simple – after all, no boy could ever fall for a girl who looked like her. I am a big fan of good modernisations of classic works, with extra points being awarded if those modernisations are written for a young adult audience. Flawless is one such novel, and Lara Chapman does a wonderful job of taking Rostand’s Cyrano de Bergerac and changing it in all the right ways to make it perfect for the young adult market. The protagonist becomes a teenage girl, Roxanne becomes the very male Rock and Christian becomes Sarah’s best friend, Kirsten. This isn’t just a lazy retelling of another author’s story, however. While Chapman takes many of her plot cues from the original, her characters and her universe are definitely her own. Each character is well-drawn and three dimensional and, while there are an awful lot of very good looking people in the book, it didn’t rub me up the wrong way, like that sort of thing often does. I think the key to this is the fact that each character’s true beauty lay beneath the surface. Sarah and Rock and smart and literate. Kirsten is canny and generous. Jay is funny and friendly and even Sarah’s glamorous mother is a driven and talented journalist. Often, the use of too many ‘apt’ quotes in a book feels forced to me but, in Flawless, the quotes that begin each chapter serve to further prompt the reader to question what beauty really is and whether the importance that is so often given to appearance is, in fact, misplaced. The plot of the novel raises the same questions and manages to do so in a non-preachy manner. For me, however, the best bit about Flawless was the way Chapman portrayed Sarah and Kirsten’s friendship. I’m so sick of stories that involve friends falling out over a boy. I’m not saying it never happens in real life, but I think it happens in a disproportionate amount of YA novels and I’m not fond of the message it sends. Here, Chapman presents best friends who act as such. Sarah is a little too selfless, yes, but her mistakes are part of the learning path that she follows throughout the book. It’s this growth that makes Flawless feel real. Sarah is a wonderfully likeable protagonist, who many readers will be able to identify with, but she is not flawless. The novel is as much a story of Sarah’s path towards self awareness and true self acceptance as it is the story of a high school love triangle. A few of the lessons learned by Sarah hit home with me as well, which I consider the sign of a well-crafted novel. 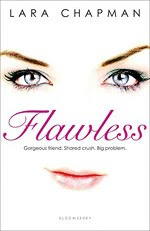 I’d love to see more books like Flawless on the shelves. I love intelligent, strong female leads, supportive female relationships and love interests who are more than just a collection of muscles and traditional good looks. And, as well as presenting a good message, it’s also a really fun read.